Walmart and Amazon are retail giants that aim to satisfy consumer needs in an all-encompassing way but also at the lowest price possible. Constant competition is inevitable and the two retail groups are consistently attempting to get ahead of the other. There are also differences between the two retailers. Both retailers are attempting to gain customer loyalty by being easily accessible to customers and offering a wide range of products. Walmart and Amazon compete with each other in almost every product category imaginable. This creates a constant price battle and special offers become a norm to entice customers. Walmart was founded in 1962 and has its roots in traditional brick-and-mortar stores. Considered a retail giant, Walmart can be found in almost every neighborhood and is seen as a one-stop shop. Walmart has had to keep up with changing trends in retail and thus entered the ecommerce field. Walmart can be seen as a cornerstone of many neighborhoods. More stores are continuously opening, which provides the community with employment opportunities. Walmart employs millions of people in several countries. Walmart has many product categories for customers to satisfy needs and wants. More products are added on a frequent basis. Considering that Walmart is to be a single shopping experience, it is important for the retailer to have enough products in stock. Net profit for Walmart is high but year-on-year growth has started to stagnate. Amazon was founded in 1994 as an ecommerce retailer. In recent years Amazon has seen tremendous growth in the online sphere. Additionally, a few physical outlets have also been opened to assist the public in picking own products. New products are constantly added to the e-commerce site – consumers can find more than 50 000 additional products per day. Amazon is also in the process of automating the checkout process in its physical stores. The new stores are also offering no checkout system as it has become synced with the customer’s smartphone. Amazon focuses on providing convenience to customers. This convenience is addressed by offering as many products as possible from which to choose and by offering free delivery to members. Amazon had only a few thousand employees a couple of years ago. The tremendous growth in the ecommerce store has opened new employment opportunities at Amazon. There are more than half a million employees currently serving at Amazon. Walmart started as physical stores and added an online store in recent years; Amazon is a giant ecommerce store with limited physical outlets. Walmart offers consumers more than 4 million products in-store ranging a broad spectrum of product categories. Amazon offers consumers more than 250 million products available online and adds more than 50 000 products per day. Walmart does not charge any membership fee for online purchases; Amazon Prime membership costs $12.99 per month or a once-off annual fee of $99. Walmart delivers products purchased online for free if the cart totals more than $35; Amazon Prime members enjoy free same-day, next-day, and two-day delivery. Walmart has more than 11 000 stores situated in approximately 27 countries. Amazon has limited physical outlets in the United States but citizens from more than 180 countries can make purchases from the online store. Walmart is cheaper in all product categories except “Foods and Beverages”. Amazon is significantly cheaper in the “Foods and Beverages” category but more expensive in other categories. Walmart had a net income of $14 billion in 2016; Amazon had a net income of $2.3 billion in 2016. However, ecommerce growth is much higher than in-store growth. Walmart and Amazon are both considered giants in the retail sector. Walmart has been part of society for much longer than Amazon. Walmart was initially focused on brick-and-mortar stores but realized the creation of an ecommerce site is vital to satisfy online customers. Amazon launched as a large ecommerce retailer but also started opening physical stores. The stores are technologically advanced and feature express checkouts. Walmart does not require a membership fee; Amazon requires members to pay a fee per month or a once-off fee annually. Walmart offers free delivery for online purchases in excess of $35 whereas Amazon members get free delivery if the person has a paid membership. Pricing between the retailers differ but Walmart is cheaper in most categories. Amazon is cheaper in the “Foods and Beverages” category, which covers the same products as Walmart. Walmart has many physical stores but purchasing from Amazon is available in more countries. Walmart has a higher net income than Amazon, but Amazon is experiencing more online growth. Ivannih Jooste. "Difference Between Walmart and Amazon." DifferenceBetween.net. 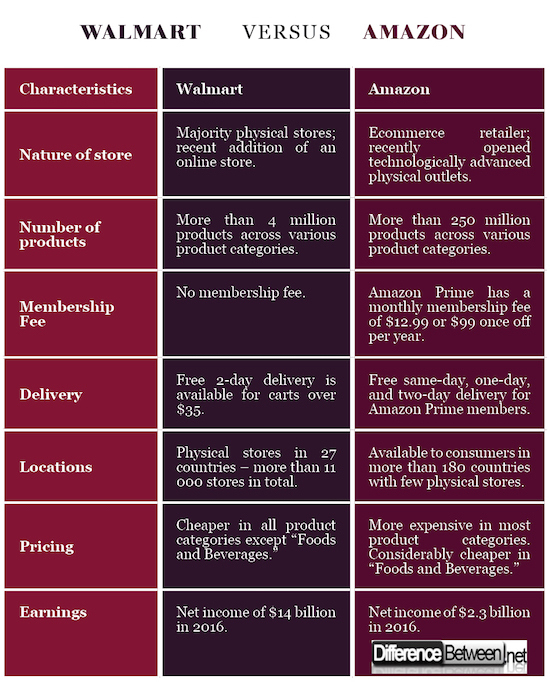 May 17, 2018 < http://www.differencebetween.net/business/difference-between-walmart-and-amazon/ >. Is there a fee for an Amazon non-prime membership?